One of the most important elements for the final appearance of a prop is the paint in the correct color. Usually automotive lacquers are used because they are relatively cheap and easy to get. That’s why they were also used to create most of the original props. However some people prefer to use an airbrush system. Remember: A surface painted with an automotive lacquer can of course be further treated with other automotive products such as car polish and wax. 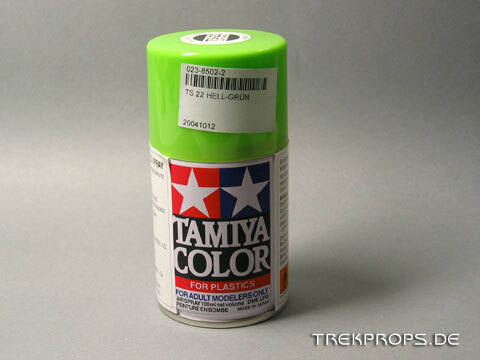 The paint pictured here as an example is Tamiya light green, the accurate color for the power bar of Cobrahead and Boomerang phasers.